Millaway – Exclusive mix for bejbi.se. The 44th of our series of exclusive mixes..
Click ”see the rest of this entry” to read more about Millaway and to download the mix. Trance, Progressive, Trance-tech, you name it! Have a listen to the sound of the Swedish based producer Millaway! As a teenage Emil listened to a wide range of music styles, but one particular style came to dominate the stereo, Trance. Actually it all started around 2001 with the track ’Dutch Force – Deadline’. If Emil’s good friend never had introduced this masterpiece to him, Emil would probably never had listened to Trance in the first place. If Emil wouldn’t have listened to Trance, then he wouldn’t have started producing either, and Dutch Force wouldn’t several years later support Millaway’s productions. You see the pattern? Electronic Dance Music was hammered frequently in the stereo for years, but producing still felt beyond reach. 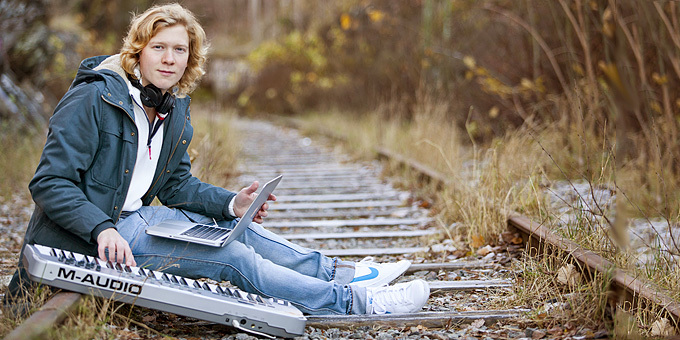 Stationed in Stockholm Sweden, while studying media and sound engineering in high school, Emil came in contact with music production through an ordinary lesson. Most engineering were done in Pro Tools, but one day everyone were introduced to the program Reason. For the first time Emil realised what he wanted to do next in life. What once had just been a vague dream, stood now knocking at the door to become reality. In the very end of high school the one-man project ”Millaway” was finally created. Time passed and a switch of software made new possibilities available. Combining beautiful melodies and progressive basslines with tech-trance elements, Millaway carved his own sound from the influences of the music he enjoyed the most. The release of ’Signs & Wonders’ at the Australian label Trance Essential was the first official footprint of Millaway that could be enjoyed all around the globe, since then things started to move forward. 2009, the debut year for Millaway, already with support from artists like: DJ Shah, Mr.Sam, Andy Moor, Bobina, DJ Feel, Suzy Solar and many others.. The support list for 2010 went as following: Paul Oakenfold, Sander Van Doorn, Richard Durand, Giuseppe Ottaviani, Airbase to mention a few. 2011 began smoothly with the release of the track ’Sockerdricka’ which immediately recived support from Rank 1 aka Dutchforce(!) among others. Now he is the 44th out for a series of exclusive mixes recorded for bejbi.se by our favorite dj´s, both well known, and unknown, that we will publish once a week untill we run dry. Download Millaway’s Exclusive mix here (right click and save as) or listen to it live on Soundcloud or just press play below here. If you want to hear more of Millaway, check out his facebook-fanpage, his myspace or his own homepage; Millawaymusic.com. One Response to " Millaway – Exclusive bejbi.se mix "